In Nevertheless, Baldwin transcends his public persona, making public facets of his life he has long kept private. In this honest, affecting memoir, he introduces us to the Long Island child who felt burdened by his family’s financial strains and his parents’ unhappy marriage; the Washington, DC, college student gearing up for a career in politics; the self-named "Love Taxi" who helped friends solve their romantic problems while neglecting his own; the young soap actor learning from giants of the theatre; the addict drawn to drugs and alcohol who struggles with sobriety; the husband and father who acknowledges his failings and battles to overcome them; and the consummate professional for whom the work is everything. 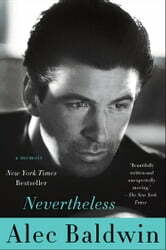 Throughout Nevertheless, one constant emerges: the fearlessness that defines and drives Baldwin’s life. Always a fan of Baldwin, I enjoyed a whole new perspective of a creatve critic whose insight and commentary was most enlightening.